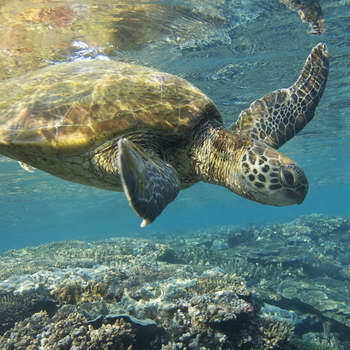 Welcome to Turtle Canyon Adventure Sail, there is no better way to start your day, than to slip into the refreshing waters off Waikiki and swim with turtles, fish, and other marine life? All of our crew are PADI certified divers and can help you realize the beauty below the surface. 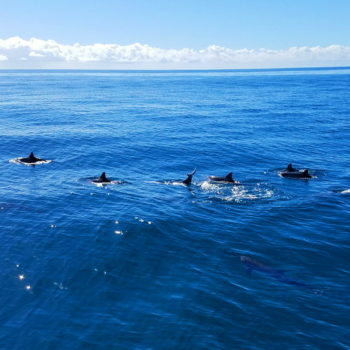 Depart on a relaxing sail through Oahu’s beautiful Waikiki waters as Spinner Dolphins play alongside and iconic Diamond Head visible in the distance. Arrive at Turtle Canyon to snorkel among large schools of Hawaiian indigenous fish like Hawaii’s State Fish the Humuhumunukunukuapua’a, and large Hawaiian Green Sea Turtles! Swim among some of Waikiki’s most amazing reefs, and take in the serenity of a morning Sail. 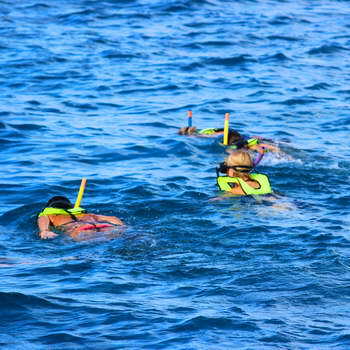 This morning eco-tour offers a fun way for everyone of all ages to enjoy the warm waters of Waikiki beach. The “Holokai” is a new powered catamaran built in Portland. This Coastguard-certified catamaran is 45-feet long and 24-feet wide and able to accommodate 49 passengers. Equipped with two 50-horsepower engines, a sound system, luxury mid-deck seating, bar, restroom, and captain and crew. 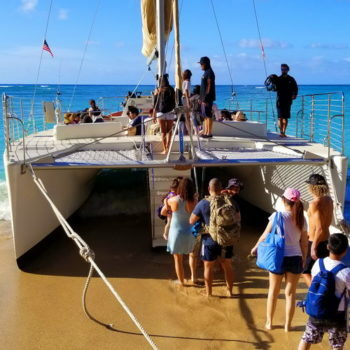 This catamaran arrived in 2106 and is the newest boat in Waikiki in over 20 years! Alcoholic and non-alcoholic beverages will be available for purchase.